In the centre of the bottom drawing a hairy skin with a mask of a horned animal is borne by two human figures. Their long trousers are visible under the skin, but nothing else of them can be seen. 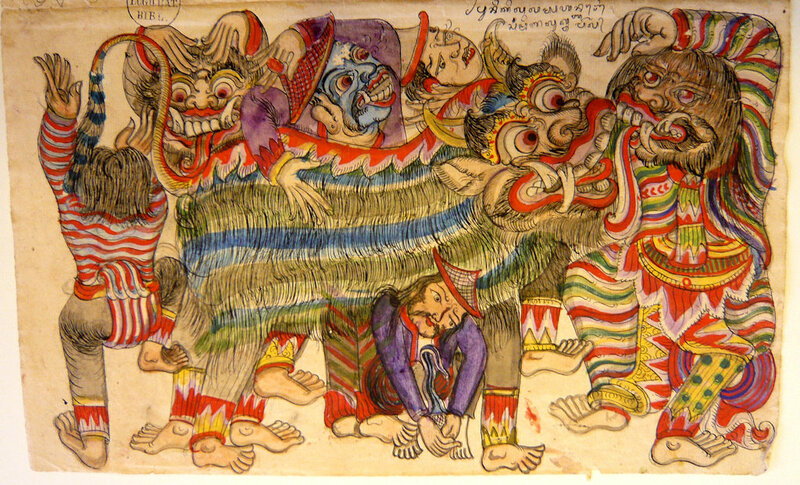 The animal is surrounded by six male figures, at least three of them are wearing masks. One man is seen at the back, so his face cannot be seen. Two pink masks with bulging eyes and protruding tongues represent leak and the third, blue mask with bulging eyes is a male demon. An ordinary man crouches at the centre in the foreground, holding a kris bend double. He has been stabbing himself, ngurek. A text in Balinese script in ink on top says: “puniki lalampahan barong, sami nyaluk tapel” this is a barong performance, all wear masks. A group of masked and unmasked men is dancing around the barong. Fourteen men and six musical instruments are drawn on the top part of the paper. The men wear trousers, saches, jackets with long sleeves. All but one are wearing hats with a rim, a cap or capil on their heads. A text in Balinese script in ink on the top says: “skaha magambel ngiglang barong”, a club of musicians accompanying the barong dance. On the left, a man beats with a stick a large gong. It hangs in a rack from a horizontal pole. A bag for the mallets hangs from the pole on the right. A text in Balinese script says: “gong”. Another man holds the gong itself, to stop it swaying and yet another is holding the ropes by which the instrument hangs from the pole. In the foreground on the left, a man sits playing a large cymbal. A text in Balinese script says: “céngcéng”. A bit more to the right a man sits playing a small gong hanging in a rack. A text in Balinese script says: “makempul”, playing kempul. A bit more to the right , two men, sitting opposite each other, are playing drums. The man seen at the back is holding a stick, panggul, in his right hand while drumming. 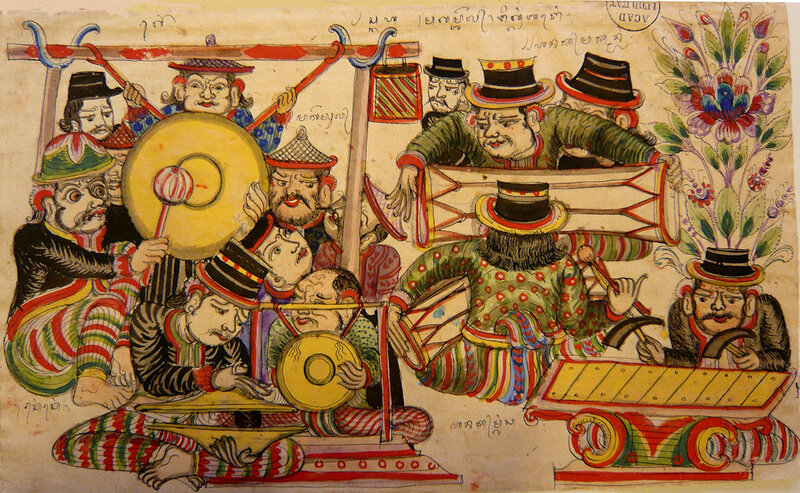 A text in Balinese script on top says: ‘hanak makandang”, men playing drums. In the foreground on the right a man is playing a metallophone with keys resting over a wooden resonator. There are two holes at each end of a key, which means that they rest on spikes. The musician handles two mallets. A text in Balinese script says: “hanak mgangsa”, someone playing gangsa. A group of six musicians and onlookers is depicted. They are wearing some kind of uniform and hats. It is probable that Van der Tuuk had this drawing in mind when he gave a specific explanation of “jahuh” in his dictionary (Vol. IV: 344): about six young men with white masks dancing around the barong and reciting parts of texts (sesandaran). The other two wear black masks”. Under “hurek”, stabbing, (Vol. I: ) he writes “stabbing oneself with a kris on the forehead, like the members of a barong club do, to show that one is possessed by the god and is invulnerable”. In Vol. IV: 801 he refers to a “gombrang” mask representing a léak that is used in a barong performance. Under “barong” (Vol. IV: 902) we read: “a certain masked performance, white hair, face of a wild animal. The sekaa barong is also engaged in ngurek”, stabbing oneself with a kris. The white hair of the barong is (Vol. IV: 78) made of the leaves of the piraksok plant.